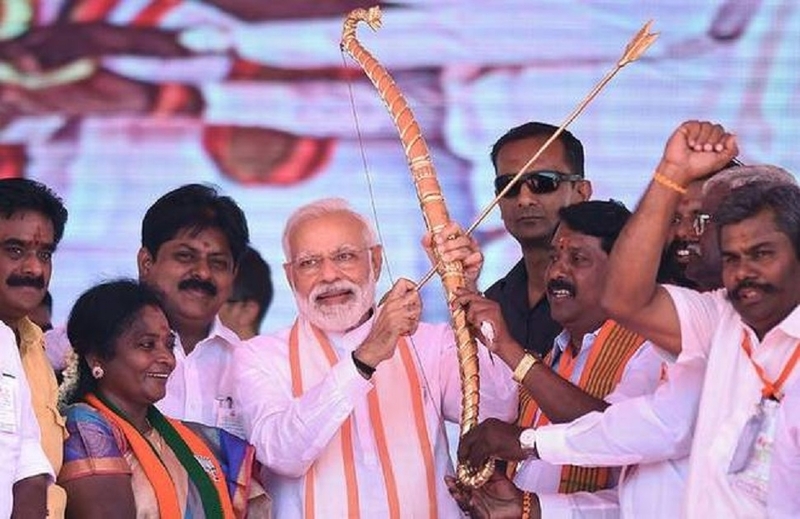 PRIME Minister Narendra Modi on Saturday sought to corner the Congress on its showpiece poll promise of “Nyay,” demanding justice for the victims of 1984 anti-Sikh riots, the Bhopal gas tragedy and violence against Dalits. While terror attacks shook the nation during Congress regime, the NDA’s policy halted it, he said at Ramanathapuram. A vote for DMK, Congress, and Muslim League combine would lead to higher taxes and less development and give a free hand to terrorists and rise of criminal elements in politics, he alleged. “Those who cannot protect India can never develop the nation. When Congress and their allies were in power, terrorists were attacking the nation regularly. City after city, there were blasts but congress remained helpless and silent.” Time has however changed now. “India will not spare a single terrorist or Jihadi. If they dare to attack us, we will find them wherever they are and ruin their happiness,” he said. Addressing a poll rally here, he alleged the Congress and dishonesty were best friends but sometimes “by mistake,” they end up speaking the truth. “Now they are saying “Ab Hoga Nyay” (justice will be done now) even if they did not intend, they have admitted that all they have done is “Anyay” or injustice for 60 long years,” (during the Congress rule), he said. “I want to ask the Congress party who will do Nyay to the victims of 1984 Sikh riots? ...Who will do Nyay to all the victims of anti-Dalit (violence), who will do Nyay to the Government of great M G Ramachandran ji, which was dismissed by the Congress just because one family did not like those leaders.” ...Who will do Nyay to the victims of the Bhopal gas tragedy, among the worst environmental disaster in India.” Congress, which talks about ‘Nyay’ has done most injustice to regional aspirations by “shamelessly,” imposing Art 356 to dismiss State Governments of M G Ramachandran, M Karunanidhi, Communists and showing disrespect to the federal structure, the PM said. His Government however believed in “co-operative and competitive federalism,” and regional aspirations mattered in policies. Blaming the DMK, Congress for vote bank politics in opposing a Bill on abolishing Triple Talaq in Parliament, Modi said, “These parties do not believe in dignity of women.” If Rahul Gandhi invoked Tamil pride and rationalist leader Periyar to target BJP’s Hindutva line, Modi countered it by referring to the legacy of late AIADMK leaders M G R and J Jayalalithaa, the welfare of Srilankan the state’s spiritual ethos. He hailed MGR and Jayalalithaa as iconic leaders who strove for the poor. BJP stood with people on the Lord Ayyappa issue, he said and hailed the state’s spiritual ethos by citing the famous hill shrine of Lord Shiva (Sundaramahalinga Swamy Temple) on Sathuragiri hills in the southern region. Similar to his recent Kancheepuram rally, he said Ramanathapuram was linked to Kashi by the bonds of faith and spirituality. In Kerala, Congress, Communists and Muslim League are playing a “dangerous” game regarding Sabarimala temple. “They are using brute force to strike at the root of faith and aspiration. Sadly for them till BJP is there, no one will be able to destroy our faith and culture,” he said in Ramanathapuram. “...We must continue working for the prosperity of our Srilankan Tamil brothers and we must end the dynasty rule of corrupt families,” he said in his Theni address. The AIADMK has been accusing the DMK-Congress combine of not taking steps to halt the killings of Tamil civilians during the Srilankan civil war in 2009, while seeking to champion their cause and Modi’s remarks resonate it. Chief Minister K Palaniswami, who also addressed the gathering, hit out at arch rival DMK over its alliance with the Congress. He asked the party to clarify whom it would support in neighbouring Kerala, whether the Congress or the CPI(M) as they both were its allies in Tamil Nadu. The DMK and Congress though “sworn enemies” have joined hands, despite the national party having “humiliated” its southern ally in the past, Modi said. Even during the 2G spectrum allocation scam, the DMK leaders criticised Congress, he pointed out. “In an attempt to mislead the people, all the corrupt have ganged up in an attempt to defeat Modi,” he added. He said the DMK has to “resort to gimmicks” just to draw people to its rallies. Picking holes in Opposition unity, he said DMK President M K Stalin’s Rahul Gandhi for Prime Minister pitch did not find takers in the grand alliance since there were other leaders with the same aspiration. The Congress, the DMK and their other ‘mahamilawati’ friends can never work for India’s development, he claimed. “This land of Theni is known for brave people who served the nation, it is now up to you to decide how you will you deal with those who questioned the surgical and air strikes done by our brave armed forces,” he said. The Indian Air Force (IAF) had carried out airstrikes on terror camps in Pakistan in February last. “When it comes to national security there can be no compromise. I assure my fellow Indians that we leave no stone unturned in protecting India and destroying forces of terror.” “Our guiding principle is nation first. Opposition believes in family first. If you go to Delhi, prime real estate has been used for memorials on members of only one family, it is as if no other person contributed to India except one family.” The BJP, however, believed in the contribution of every citizen in making India stronger and that was why a grand memorial was built for Kalam in Rameswaram, he said wrapping up his election campaign in Tamil Nadu. There were no memorials for past Presidents like Dr S Radhakrishnan though in every town, Congress had named so many roads and buildings after “one family.” In both rallies, Modi referred to ongoing development projects in Tamil Nadu and listed his governments welfare initiatives like the free LPG connections. PRIME Minister Narendra Modi on Saturday said the Lok Sabha polls was not about choosing the Prime Minister or a Government, but on how “New India” should be in the 21st century. Addressing a massive rally here, he hit out at the Congress, saying that the country gave it an opportunity in 20th century, but the party lost it by handing it over to one family. He added that “Mahamilavat” has weakened the Defence and the economy.